For the first time, smartphone penetration crossed the 50% threshold, with 51.0% of US mobile subscribers (119.3 million people) owning a smartphone during the three months ended September, up 8% from the three months ended June 2012, according to data from the comScore MobiLens service. Though Google's Android operating system retained a lead of 18 percentage points over Apple's iOS in the September 2012 period, Google's monthly share growth slowed while Apple's continued to gain momentum. Android's share of the US smartphone market grew a modest 0.9 percentage point in September 2012, reaching 52.5%, while Apple's share increased 1.9 percentage points, to 34.3%. 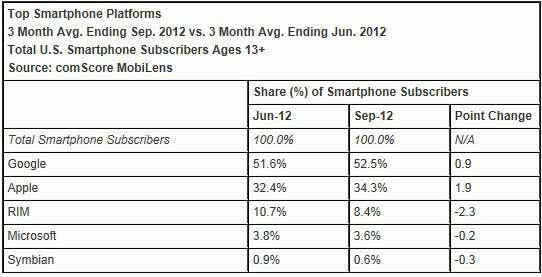 RIM ranked third with 8.4%, followed by Microsoft (3.6%) and Symbian (0.6%).